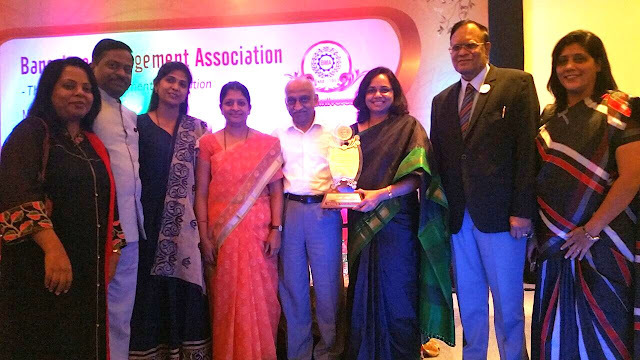 Bengaluru, 29th December, 2016: Bengaluru Management Association (BMA) conferred Prin. L. N. Welingkar Institute of Management Development (WeSchool) with the ‘Academic Excellence of the Year 2016’ award at its recent annual awards ceremony. The award was presented by the Chief Guest Honorable Chief Justice Sri S Rajendra Babu. Bengaluru Management Association is a leading body for disseminating and upgrading of managerial skills amongst professionals in Karnataka and has been in existence for over 60 years. Dr Anil Rao Senior Dean & Senior Vice President-Strategy & Branding, WeSchool (Bengaluru) along with Prof Dr Madhavi Lokhande, Dean, WeSchool (Bengaluru Campus) and other faculty members received the award. 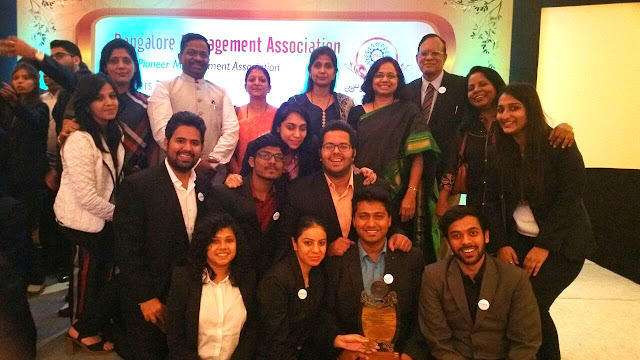 While last year the Institute bagged the ‘Best B-School’award by the BMA’, in 2016, WeSchool Bengaluru was also awarded ‘Best Innovative Practice Award in Management Education’ by NHRD and the ‘HUL Best Industry Linked Emerging Management Institute’ by AICTE-CII. Weschool, Bengaluru offers full-time management programs viz PGDM, PGDM E-Biz, PGDM Business and Design and several management development programs for leading corporates. WeSchool has adopted the pedagogy of improving the conceptual aspects of knowledge with adequate emphasis on the application and assimilation of the acquired theoretical inputs. The institute’s academic philosophy has been that of AAA which stands for ‘Acquisition, Application and Assimilation of Knowledge’. WeSchool has received this award in recognition to the contribution made by the institute in the area of management education. Among India’s top business schools, WeSchool is a pioneering management education institution with emphasis on design-led innovative management education for shaping vision and mission of global citizen leadership. WeSchool strongly believes in integrating the philosophy of ‘leadership’ and ‘innovation’, and nurtures students with a holistic view on the socio-economic-political matters with a coherent and strategic approach towards problem solving. Keeping design and innovation its core, WeSchool endeavors to provide newer avenues to students towards achieving excellence in all sphere of life and nurture them to become Global Citizen Leaders. WeSchool has collaborated with MIT Media Lab, Stanford Design School, IDEO, and Center for Creative Leadership among others. WeSchool partners with several leading universities globally on an array of areas. And among its collaborations with foreign Universities: Mälardalen University (Sweden), Curtin University (Australia), Unitec Institute (New Zealand), Grant McEwan (Canada), Copenhagen University (Denmark), Otto Friedrich Universitat (Germany), Audencia Nantes(France), Stuttgart Media University (Germany). Tel-Aviv University, IDC Herzliya, and Ben-Gurion University of the Negev (Israel).